+1 Worked for a friend recently, had to call a few times. I’ve done HUcA 10 times agent keeps telling me can’t do the plan B within 24 hours. Of course she didn’t say the words plan B just that she can’t deduct the saver miles from my account for J class because it’s within 24 hours. True? New rule? 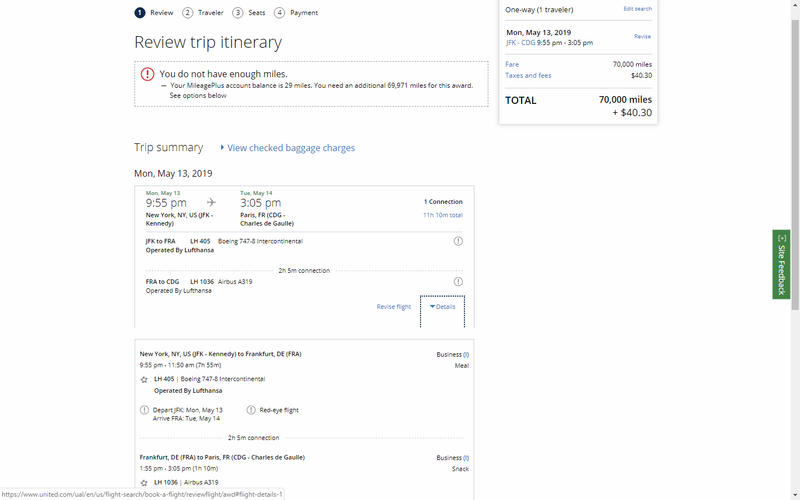 NYC-FRA-PAR in j via Lufthansa airlines for 70k+$40. Tried via Miles&More They wanted 52k plus $500-$600 in taxes. I do not think it is overpriced, the MM taxes are high. And for the LH flight seems about right? Would fly with AF or IB if I can find avlblty. Why don't you seach NYC? Think im going to take a direct rather then fly j with a stopover for 70k+$40 vs economy direct for $175. It reverts back to EWR so had to search LGA and JFK separately. Put in JFK. Should work for all 3 NYC airports. Some times yes and sometimes no. I think your looking for this thread above. Redeemed United miles for an international flight on Air Canada with a domestic connection. I called United to add an infant, and they wanted $400 for the infant. I asked for supervisor to try reprice it, coz that's ridiculous for an economy seat. They didn't budge on price and said to call air Canada to try add the infant. But now when I look on the reservation on the air Canada site, it has my infant recorded with a ticket number. I contacted air Canada, and they say that from their end, the infant is 100% confirmed. Is there a chance they'll cancel it?